I haven’t been making a lot of cakes recently. I’m a fair to average decorator and for me they can be quite labour intensive. I do it because I love it (most of the time) and I love the people I make these cakes for (most of the time ;)). I started baking cakes as far back as I can remember. The first one that stands out is when I was about 8 years old and my mum let me make my brothers birthday cake. Baking has always come very easy to me. Just like others have a head for math or building, I’m a baker. I find it soothing and relaxing to mix the ingredients, let it cook and then you’re done. Its different to cooking dinner and stuff like that. Not as hectic. Sounds crazy, right?! Anywho, I had a friend ask me to make her son a monsters inc. themed cake. After a bit of back and forth we decided it would be Sully and pretty much whatever i wanted to do, she let me have free reign. Dont you love it when that happens?! So I did what I normally do and Google for inspiration. A lot of the cakes had furry like icing and I thought, I could give that a go! 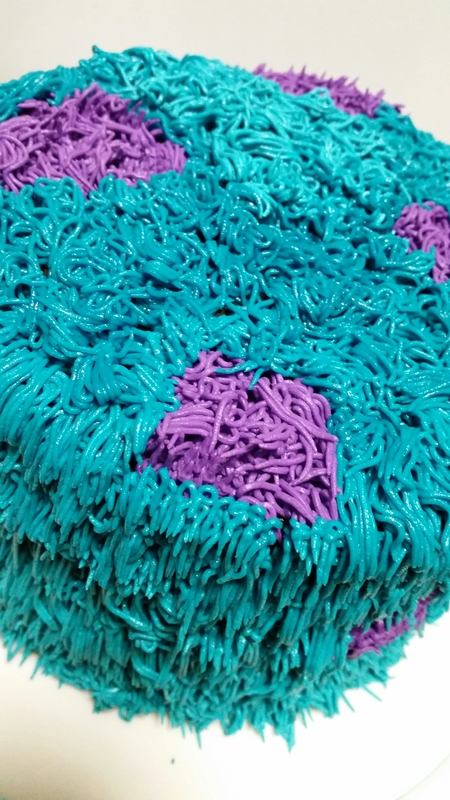 So once I had baked my chocolate mud cake, ganached it and placed it on a covered base board, I set upon making the dark teal and purple buttercream. I made up a batch of buttercream icing (recipe below) and split it into 2 bowls. As I only needed a fraction of the icing for the purple, I split it 1/4 for purple & 3/4 for dark teal. To get the colours I needed I used a mixture of colours. The primary colour is what I used for the base and I added the secondary colour to make the base colour a bit deeper. Just be careful when adding the second colour, you dont want to over power the base colour. 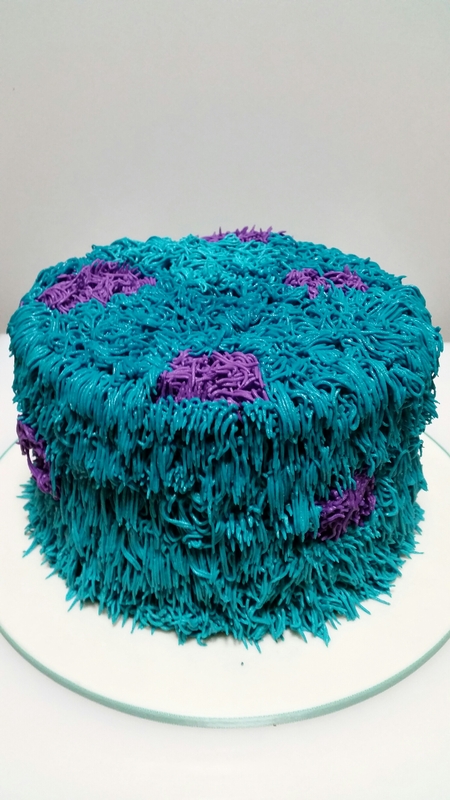 Using Wilton tip 233 (you can find it here) I first piped the purple then the teal. It took a lot longer than I expected but it was quite easy. Just be sure to have a few mini breaks and flex that piping hand! 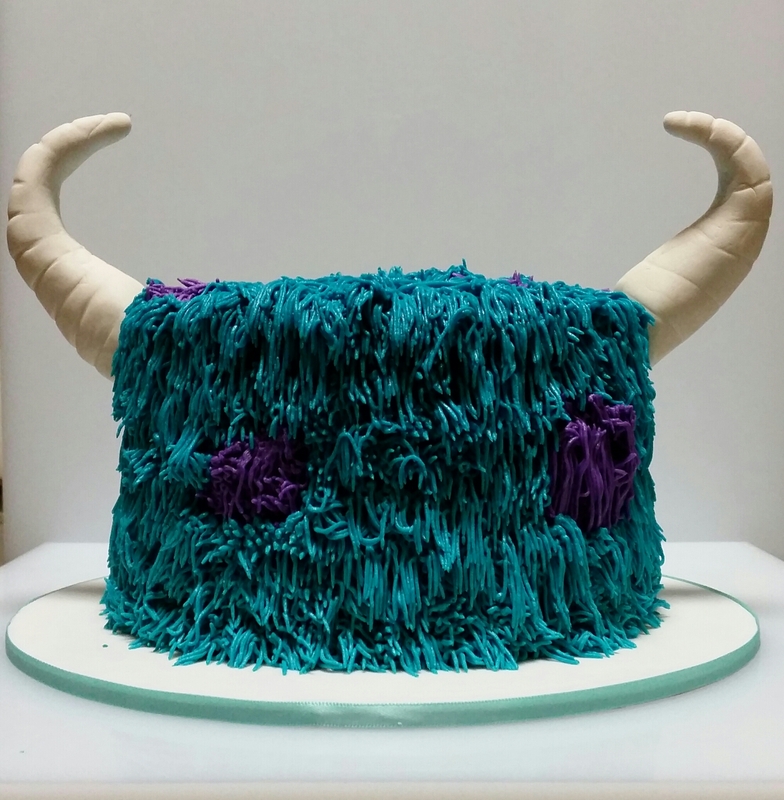 I made the horns out of Satin Ice gum paste with a bit of tylose added to it. Tylose is an additive that will make your gumpaste dry harder. Its particularly useful with the satin ice brand of gum paste as it can be still quite soft weeks later, especially when making thicker models such as horns or shoe heels. I wasn’t too fussed about making these horns perfect, they are not supposed to be. I just needed to get them in the right shape and then using the back of a butter knife I scored lines around the circumference of the horns. I used wooden skewers cut in half to attach them to the cake! This cake turned out even better than I thought it would and my friend was very happy with it as well.